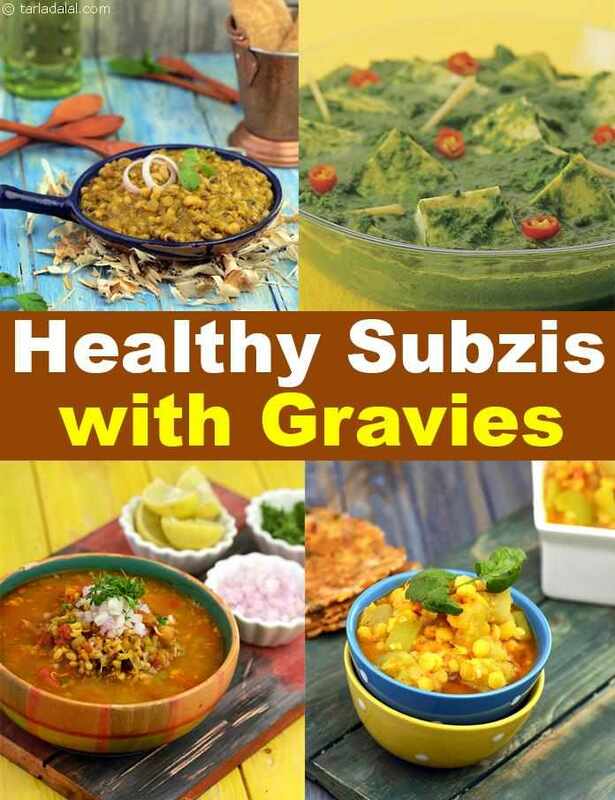 Healthy Subzi with Gravies Recipes, Healthy Veg Curries. When we think of gravies we visualize a red gravy cooked in oil or a white gravy with a cashew base or a brown gravy made with fried onions. But this section is a myth-breaker to all of these. Learn the art of making all these gravies the healthier way. Cauliflower, Methi and Carrot in White Gravy, Healthy Koftas in Makhani Gravy, Khumbh Palak, Kofta Makhani are some interesting delicacies you would definitely be tempted to indulge in on occasions. This section also holds place for a variety of new gravies whipped up to make more healthy additions to our meals. Broccoli and Zucchini in Red Capsicum Gravy, Baked Doodhi Kofta Curry and Cabbage Soya Koftas in Coriander Tomato Gravy are a few such examples. Try these interesting variations and welcome health for you and your family. The recipe for Gavarfali ki Subzi is a proof that traditional vegetables can be cooked in contemporary ways. Masala Chawli is the perfect recipe for a winter’s day packed with protein and has a peppy taste. Enjoy our collection of Healthy Subzis with Gravies, HealthyCurries and Healthy Subzi articles below. The pleasing bitterness of fenugreek leaves goes beautifully with the creaminess of cauliflower and the mild sweetness of carrots. This thoughtful assortment of veggies becomes all the more desirable when combined with a lip-smacking white gravy made of onions, milk and myriad spices. Widely available and full of nutrients, spinach makes a colourful and flavoursome companion to corn.